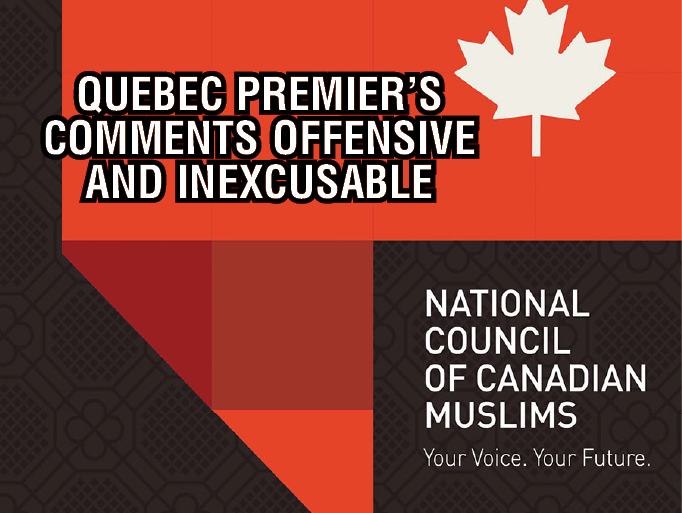 (Montreal - January 31, 2019) The National Council of Canadian Muslims (NCCM) says that Premier François Legault’s comments today denying the existence of Islamophobia in Quebec are “highly offensive and inaccurate” and is urging him to publicly retract his statement. “These comments, coming less than 48 hours after Premier Legault stood on a stage and publicly commemorated the murders of six Quebec Muslims in the January 29th Quebec City mosque attack, are an absolute insult to the families of the victims and to Muslim communities in Quebec and across Canada who continue to grieve this tragedy,” says NCCM Executive Director Ihsaan Gardee. The NCCM is an independent, non-partisan and non-profit advocacy organization that is a leading voice for Muslim civic engagement and the promotion of human rights.